Cognizant, Tata, Infosys were the top three users of H-1B visas in 2012, reports US IT publication Computerworld. It outlines how the visa, meant to allow US employers to temporarily employ foreign workers, is being used most by companies who have their primary employee bases outside America. NASDAQ listed Cognizant had 9,281 H-1B visa approvals in 2012 according to Computerworld analysis. The IT and BPO services company is headquartered in Teaneck, New Jersey and has a global workforce of 1.57 lakh employees as of 31 December 2012, according to a recent company fact sheet. Various reports claim that more than 1 lakh of those employees are based in India across its centres in Chennai, Bangalore, Gurgaon, Mumbai and Pune among others. Headquartered in Mumbai and employing over 2.6 lakh staff globally, Tata Consultancy Services (TCS) was the recipient of 7,469 H-1B visa approvals in 2012. The BSE listed subsidiary of Tata Group said in a recent press release that non-Indian nationals accounted for only 7.6% of its total workforce. 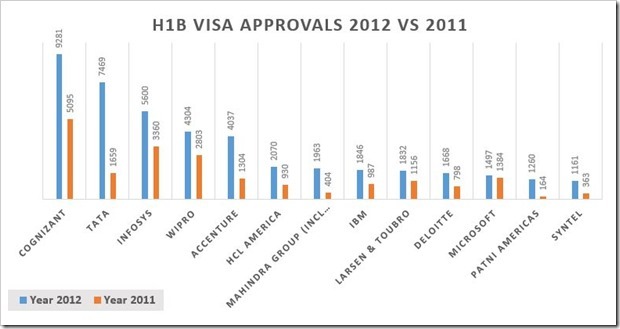 Infosys received 5,600 H-1B visa approvals in 2012. The company has 1.56 lakh employees worldwide and has infrastructure to accommodate 1.53 lakh seats, out of which 1.41 lakh are in India, according to its fact sheet. 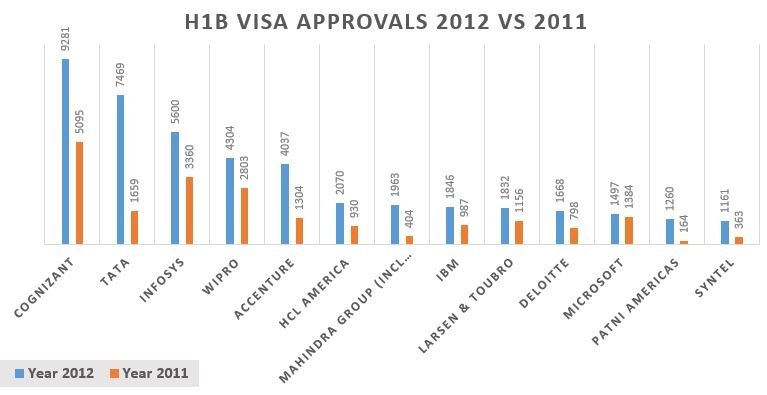 Wipro, Accenture, HCL America, Mahindra Group, IBM, Larsen & Toubro, Deloitte, Microsoft, Patni Americas and Syntel completed the list of top 10 users of H-1B visas in 2012. Computerworld’s report outlines concerns of two camps in favour and against H-1B visas. A section supporting the H-1B visa which includes Microsoft, claims that the visa is vital to their hiring needs. In fact, the Bill Gates’ founded software giant suggested in October 2012 that the fee for H-1B visas be raised to $10,000 or approximately 5.3 lakh. Apart from addressing a skill shortage in US, increased fees for H-1B and Green Card would reportedly have the potential of raising over $5 billion in revenues in 10 years. According to reports, many Indian companies including Infosys, TCS, Wipro and HCL Technologies have stepped up local hiring in US in the last few years. According to ET, TCS and Infosys were expected to create 2,000 jobs locally in US in 2012 while Wipro employed 3,500 staff in America at the time. In addition, Chairman of Wipro Azim Premji wanted 50% of the company’s workforce in overseas locations to be local. Critics of the H-1B visa believe that it is escalating offshoring when companies with a majority of workforce outside America are maximum users of the visa. Commentators have been seen in part, refuting these claims as the companies using the H-1B visa contribute to the local economy. Apart from local job generation, expansion in size of US operations would boost the local economy. Cognizant Moves 8000 Jobs Out Of India; Increases Headcount In US! TCS, Infosys Join Global IT Firms For ReSkilling 1 Mn Workers! Attrition Rate Drastically Falls In The Big IT Firms; TCS Hiring Drops By 85%!